We’re living in days of alienation. In the name of peace we wage war on each other; in the name of honor we smear the other side. And with broken families, broken hopes, and broken morality, we are estranged even from ourselves. We’re in search of a country, a country ‘great again’…but the sins of the past have come back to haunt us. Best to look forward to the world to come. It’s found in the Church—our true country—whose borders are marked by transformation and rebirth. Nothing ‘pie-in-the-sky’ about it, the Church is the embassy on earth of the Heavenly Jerusalem above. Here, the Lord Jesus Christ is present on His throne, not absent from the world at all. We breathe a different air here, where heaven joins earth, transfigures it, and unites humanity with divinity. No ‘fake news’ here, but ‘good news’ of forgiveness of sins and fellowship with the saints. And we go within, to the Kingdom of God inside us, birthed by baptism, watered in prayer, and nourished through Holy Communion. We savor the Lord’s Supper, not fast food for the masses. And it’s served not by robots, but by the successors of the Apostles, of which the Orthodox Church enjoys an unbroken continuum. It’s been said that a country’s culture resides in the hearts of its people. while a culture of division and animosity splinters any shred of unity that’s left in America. unites synagogue with state, and denies the birth of Jesus Christ. The Maccabees without the Messiah only means wars and rumours of wars for the Jews. But the citizens of the Church, with Christ birthed in their hearts, celebrate and taste of God’s Kingdom to come. We have an altar, Christ’s own festal table, whereof they have no right to eat who await a sham Jewish temple—awash in stinking animal sacrifices—that has no priesthood, no atonement. For without a priesthood, Jewish worship is worthless. But the Church’s priesthood is after the Order of Melchizedek—foretold by the prophet David—with Christ as High Priest, where the Apostles’ successors - the Bishops, accomplish the New Covenant sacrifice. America has fallen…everyone knows it…the Jews have crucified God afresh. I’m STILL in a dismal financial situation since PayPal banned me back in February. I’m broke and deep in debt. * Research Materials; Special Projects; Sophisticated Software for Video editing (monthly leasing fees); & Assistant for Producing My State-of-the-Art Videos; Legal Fees. CAN SOMEONE(s) PLEASE float me a loan for $5,000 or $10,000? I’ll arrange a 12 month repayment with a notarized IOU. “Network for Good” Donation Venue is NOW up! The really really GOOD NEWS is No One on Earth HAS to be a JEW! Knowing the Truth about the Anti-Christ BAD FAITH “Religion” of Talmudic Judaism is the Exit strategy from the Cult compound. There is no TRUTH in the “JEWISH” Narrative. John 8:44. Modern day Jews, PROSELYTES to Talmudic Judaism will never be “Israel”. - Genesis 49 & Deut. 32 & 33. Great video and message Bro Nat. Glad you got my donation Brother Nate. Anymore, I have to consider whether donations to you don’t get “misplaced” in the mail. No incoming mail to me ever gets “misplaced.” I receive ALL my mail, including cash donations securely and safely. When I do Street Evangelism in DC I stand on the median strip on 9th and Pennsylvania with the monstrous FBI building on my left and the DOJ on my right. They have seen me for over TWO YEARS there. Many of them come up to me to and from work THANKING me for my witness. God bless you for a stunning masterpiece about Orthodoxy and where our True Home in Christ ultimately rest. I so needed the reminder that the Vale of Tears that this world has become is still not our final eternal destination after all, and that we are merely sojourners on it, and we should be buoyed by hope and faith in the things far distant and unseen which are promised to be our inheritance in Christ. “Dear friends, I urge you, as aliens and strangers in the world, to abstain from sinful desires, which war against your soul. Christ isn’t “out there, that away, somewhere” for the Orthodox Church, He is the Head of the Ecclesia, and is invisibly present through the Holy Spirit. The Apostle instructs those who have come to believe in Christ and have been joined to the Church as follows: Ye are come unto mount Zion, and unto the city of the living God, the heavenly Jerusalem, and to an innumerable company any of angels, company I to the general assembly and church of the first born, which are written in heaven, and to God the Judge of all, and to the spirits of just men made perfect, and to Jesus, the Mediator of the new covenant (Heb. 12:22-24). We are not separated from our dead brothers in the faith by the impassable abyss of death: they are close to us in God, for all live unto Him (Luke 20:38). Of course, there is a distinction between the Church of Christ on earth and the Church of the saints in heaven: the members of the earthly Church are not yet members of the heavenly Church. “We believe, as we have been instructed to believe, in what is called, and what in actual fact is, the Holy, Catholic, Apostolic Church, which embraces all those, whoever and wherever they might be, who believe in Christ, who being now on their earthly pilgrimage have not yet come to dwell in the heavenly homeland. “But we do not in the least confuse the Church in pilgrimage with the Church that has reached the homeland, just because, as certain of the heretics think, one and the other both exist, that they both comprise as it were two flocks of the single Chief Shepherd, God, and are sanctified by the one Holy Spirit. And in actuality, the earth and the heavenly world are two separate forms of existence: there in heaven is bodilessness, here on earth are bodily life and physical death, there, those who have attained, here, those seeking to attain; here, faith, there, seeing the Lord face to face; here, hope, there, fulfillment. Nonetheless, one cannot represent the existence of these two regions, the heavenly and the earthly, as completely separate. If we do not reach as far as the saints in heaven, the saints do reach as far as us. As one who has studied the whole of a science has command also over its elementary parts, just as a general who has entered into a country has command also over its borderlands; so those who have reached heaven have in their command what they have gone through, and they do not cease to be participants in the life of the militant Church on earth. The holy Apostles, departing from this world, put off the earthly body, but have not put off the Church body. They not only were, but they also remain the foundations of the Church. The Church is built upon the foundation of the Apostles and Prophets, Jesus Christ Himself being the chief cornerstone (Eph. 2:20). Being in heaven, they continue to be in communion with believers on earth. Such an understanding was present in ancient Patristic thought, both of East and West. Here are the words of Chrysostom: “Again, the memorial of the martyrs, and again a feast day and a spiritual solemnity. They suffered, and we rejoice; they struggled, and we leap for joy; their crown is the glory of all, or rather, the glory of the whole Church. “How can this be? You will say. The martyrs are our parts and members. But, whether one member suffer, all the members suffer with it; and one member be honored, all the member’s rejoice with it (I Cor. 12:26). “The head is crowned, and the rest of the body rejoices. One becomes a victor in the Olympic games, and the whole people rejoices and receives him with great glory. If at the Olympic games those who do not in the least participate in the labors receive such satisfaction, all the more can this be with regard to the strugglers of piety. “If their Master is not ashamed to be our Head, then all the more, they are not ashamed to be our members; for in them is expressed love, and love usually joins and binds things which are separate, despite their difference in dignity” (St John Chrysostom, “Eulogy for the Holy Martyr Romanus”). “Acknowledge that all the saints are our elder brothers in the one House of the Heavenly Father, who have departed from earth to heaven, and they are always with us in God, and they constantly teach us and guide us to eternal life by means of the church services, Mysteries, rites, instructions, and church decrees, which they have composed—as for example, those concerning the fasts and feasts—, so to speak, they serve together with us, they sing, they speak, they instruct, they help us in various temptations and sorrows. And call upon them as living with you under a single roof; glorify them, thank them, converse with them as with living people; and you will believe in the Church” (St. John of Kronstadt, “What Does It Mean To Believe In The Church? Thoughts About the Church and the Orthodox Divine Services”). The Church in its prayers to the apostles and hierarchs calls them her pillars, upon which even now the Church is established. “Thou art a pillar of the Church”; “ye are pillars of the Church”; “Thou art a good shepherd and fervent teacher, O hierarch”; “ye are the eyes of the Church of Christ”; “ye are the stars of the Church” (from various church services). In harmony with the consciousness of the Church, the saints, going to heaven, comprise, as it were, the firmament of the Church. “Ye do ever illumine the precious firmament of the Church like magnificent stars, and ye shine upon the faithful, O divine Martyrs, warriors of Christ” (from the Common Service to Martyrs). “Like brightly shining stars ye have mentally shone forth upon the firmament of the Church, and ye do illumine the whole creation” (from the Service to Hieromartyrs). There is a foundation for such appeals to the saints in the word of God itself. In the Apocalypse of St. John the Theologian we read: Him that overcometh will I make a pillar in the temple of my God (Apoc. 3:12). Thus the saints are pillars of the Church not only in the past, but in all times as well. In this bond of the Church with the saints, and likewise in the Headship of the Church by the Lord Himself, may be seen one of the mystical sides of the Church. “By Thy Cross, O Christ, there is a single flock of angels and men; and in the one assembly heaven and earth rejoice, crying out, O Lord, glory to Thee” (Octoechos, Tone 1, Aposticha of Wednesday Matins). The ninth article of the Symbol of Faith indicates the four basic signs of the Church: “We believe in One, Holy, Catholic and Apostolic Church,” These attributes are called essential, that is, those without which the Church would not be the Church. –From Orthodox Dogmatic Theology (St. Herman of Alaska Brotherhood Press, 1994), pp. 222-246. One major problem in the US is the love affair and “respect” Americans have for the Jews. This cannot be changed. In addition, we have the problem of the Christian Zionists. I am so angry and disgusted that my wish is: If NATO-Zio US is successful in starting WW3, perhaps Russia’s first target may possibly be Israel. This is not a good plan when facing an enemy who knows Zio-christians are soft and squishy about taking human lives. They will always lose with this mindset. Russian Orthodox Christians are very different and will do whatever is necessary to defend their country. Many of my friends and relatives have turned their backs on me for trying to explain how decayed the US has become and the controlling power the Jews and the MIC have, and how they work together. But, I will never trade my beliefs for anyone’s friendship. I consider them cowards and traitors. I admire your efforts but I think the US has passed the point of no return. Most citizens lack the intelligence, courage and patriotism to save the Nation. I will get some pleasure in seeing them eventually get what they deserve for selling out their Country. God helps those who help themselves. I think Americans will get no help, they deserve no help. The US is heading into the scrap heap of history as Pat Buchanan has said. There is some good news amidst all the bad. President Trump made an announcement today to remove transgenders from the military, undoing the most pernicious, sinister actions of Barack Obama; i.e., ordering the Pentagon to allow transgenders into the Armed Forces. Of course, Trump’s announcement to rescind Obama’s transgender order had the Libs and their Bolshevik Jewish all in an uproar. Transgender personnel were also upset. The best way to weaken the Military, according to Obama and his minions, was to open it to transgenders (it was already opened to homosexuals and lesbians). This has been part of the Jewish agenda to destroy the US. And this is where the Church sorely needs to play a vital role in the redemption of this nation. Apparently, Obama’s selection as POTUS was a form of punishment from God for America’s evil ways. Yes, this was a wake-up call to return to the values that had made this nation great. Obama’s the worst President the US ever had, and Trump’s announcement to rescind his predecessor’s worst Executive Orders regarding transgenders using women’s facilities and/or joining the military’s waking more and more people up. I’m glad you’ve been able to visit a number of cities across the nation and preach the Gospels to thousands, if not millions, of people.And the fact that every visit was a huge success testifies to your popularity. That so many who watch your videos and read your articles haven’t been contributing to your Foundation and still don’t contribute is sad. One can excuse the lack of funding from those of us who are struggling as you are, but those with six-figure incomes or higher that haven’t been contributing have no excuse and should be contributing to your Foundation. These wealthy people could lend you what you need ($5,000, $10,000, $25,000) to keep you afloat. I’m sending my small contribution out to you in the hope that you’ll be able to continue the mission the Lord Jesus gave you. The US military is IMMORAL. So what’s the big deal of having immoral trannys in the US military? They have broken Christ’s creational ordinance of segmenting the race between male and female for the purpose of procreation through Holy Matrimony by denying their God-given anatomy with their self-mutilation. The MORAL issue is NOT whether homosexuals and transvestites can serve in the military. The ISSUE is the US military must STOP its IMMORAL, EVIL, MURDEROUS, WARS FOR THE JEWS abroad. PS MANY thanks for your ONGOING support and your Comments here! I just wish I could do something to get enough money to both donate to you and to do other things. Also, I was wondering if you could shed some light on that new bill made by AIPAC to criminalize BDS (Boycott, Divestment, and Sanctions) against Israel that, among other things that violate the 1st Amendment, can land you a fine of up to $250000 along with 20 years in prison, and how it has bipartisan support from the Jews and their puppets. This may be a great opportunity to truly convince more and more people of the ZOG who really runs things in America. If this display of arrogance doesn’t convince them, nothing will. Back about 10 years ago, there was a meeting among representatives of a dozen or so patriarchates, sponsored by Pope Benedict and held in Ravenna, that had agreed to discuss the issue of the status of the Pope of Rome as having primacy, as was the case before the schism. However, the representative from the Russian patriarchate walked out in protest that a Lithuanian representative was also there; which Moscow does not recognize as legitimate. All in attendance did agree, at least in principle, that Rome does have primacy (at least in an honorary sense). However, Moscow was absent, and said that the matter would be studied later. Does anyone know what ever became of this? Francis, if you’re an American call your DC “representatives” offices and ask them where they stand on S.720 or HR.1697. I used KathJulaine’s post from Brother Nate’s previous article as a reference. One of my DC pol’s staffers said there are no penalties attached to the bill. This is nonsense… every law comes with penalties attached. In any event the pols are having to do some backpedaling because enough of us are confronting them on these anti-Constitutional bills. “Constitution? Don’t tell me about the Constitution? It’s just a g…damn piece of paper.” - George W. “Shabbos Goy” Bush. I can look into it by asking some of our Russian Orthodox hierarchs. But what I do know is that the present Patriarch of Russia, Kyrill, and his predecessor, Alexy, were in favor of continued dialogue with the Pope of Rome and practiced such. For, as it is written, “The name of God is spoken detestfully of among the Nations because of you (Jews).” Romans 2:24 (Cf. Isaiah 52:5). “With this nutty bill now having 45 co-sponsors in the Senate and 237 (245 now) in the House, it’s becoming increasingly clear that the locus of control for the policies of the U.S. is moving eastward, rapidly, from the old location in Washington DC to the new one in Tel Aviv ( and/or Jerusalem). (2) encourages full implementation of the United States-Israel Strategic Partnership Act of 2014 through enhanced, governmentwide, coordinated U.S.-Israel scientific and technological cooperation in civilian areas. – restrictive trade practices or boycotts fostered or imposed by an international governmental organization, or requests to impose such practices or boycotts, against Israel. – requesting imposition of any such boycott, against Israel. – supporting any boycott fostered or imposed by an international organization, or requesting imposition of any such boycott, against Israel. –any part of U.S. government. Corporation/business/organization/group incorporated in the United States under U.S. law includes churches, mosques, religious and relief organizations and other non-profit companies. Some have international reach and overtly pro-Palestinian, or else are American mainstream church which are committed to ethical business investments and have divested from Israeli, joint Israel-American, or pro-Israel businesses, investments and mutual funds in their portfolios. The ADL and the Jew Power routinely attacks the churches and religious organizations who plan to divest. Palestine Legal is an informative and educational activist site which also covers States who have, or are in the process of, passing anti-BDS legislation protecting Israel. There are currently ten States which have passed anti-BDS legislation. There is no “left” or “right” issue threatening constitutional freedoms, or having the background supporting Palestinian rights, exposing Israel’s chronic wrongdoings against Palestinians as a brutal military occupier and standing up for justice. The Israel Anti-Boycott Act, introduced in the U.S. Congress in March 2017, would prohibit U.S. persons from supporting boycotts for Palestinian rights fostered by the United Nations, European Union, or other international governmental organizations. Violations are punishable by exorbitant fines and up to twenty years in prison. Due to recent widespread outrage over this bill, including from the ACLU and grassroots activists, its chief Senate sponsor, Maryland Senator Benjamin Cardin, has stated that he would amend the bill to remove criminal penalties. Amending the bill does not resolve its underlying problems. The bill must be rejected. Senator Cardin has written that the bill does not target political boycotts, including boycott, divestment and sanctions (BDS) campaigns. Instead, he claims that the bill merely expands preexisting law to prohibit U.S. businesses from complying with boycott requirements imposed by international governmental organizations. In other words, Senator Cardin argues that the bill does not prohibit political speech but targets “commercial conduct,” which is afforded less constitutional protection. First, some political speech activities will be directly prohibited by the Israel Anti-Boycott Act, in violation of the First Amendment. For example, if a human rights organization that supports a boycott of companies operating in illegal West Bank settlements furnishes its research on those companies to an international governmental organization (or to anyone, for that matter), it could be in violation of this bill if the organization’s intent is to support a boycott of settlements fostered by the international governmental organization. Second, we have no doubt that this bill will empower overzealous administrations to target BDS supporters for investigation and possible punishment, with Arab and Muslim communities likely facing the brunt of the scrutiny. first in the “Findings” section, where it refers to past Congressional action regarding BDS campaigns; and second, in the “Statement of Policies” section, where it states explicitly that Congress views a recent resolution adopted by the United Nations Human Rights Council as an “action to boycott, divest from, or sanction Israel,” implying a direct link between an international governmental organization’s statement and First Amendment-protected BDS campaigns. Our belief that the bill, if enacted, will be enforced to target those who support BDS campaigns is not based on irrational paranoia or fear; it is based on a pattern of suppression of First Amendment-protected speech and conduct supportive of Palestinian rights. This includes heightened government surveillance, investigations, and prosecutions of individuals due to their support for Palestinian freedom, as well as private harassment and targeting, including by organizations that support this bill. Between 2014 and 2016, Palestine Legal responded to 650 incidents of suppression nationwide targeting speech supportive of Palestinian rights, an additional 200 requests for legal assistance in anticipation of such incidents, and dozens of efforts to enact federal, state, and local laws aimed at punishing BDS activism and chilling speech supportive of Palestinian rights. Palestine Legal and the Center for Constitutional Rights documented this pattern of suppression of Palestinian rights advocacy in a 2015 report, The Palestine Exception to Free Speech: A Movement Under Attack in the U.S.
Third, the bill has the intent, and will have the effect, of chilling First Amendment-protected political speech. In the past two years, twenty states have enacted laws aimed at punishing participation in political boycotts for Palestinian rights. Together with these state laws, the Israel Anti-Boycott Act will create a severe chilling effect on people across the country who are otherwise inclined to support First Amendment-protected boycotts for Palestinian rights, or are curious to learn more. The regime of anti-BDS legislation, promoted by Israel advocacy groups to undermine the movement for Palestinian human rights in the U.S. and mirroring anti-BDS efforts in Israel itself, aims to send a clear signal that support for Palestinian rights, whether through support for BDS campaigns or otherwise, is disfavored by our government, and potentially punishable. Statements by state officials and Israel advocates promoting such legislation explicitly admit their intent to thwart grassroots boycott campaigns. Amending the bill will not solve the underlying problems listed above, which point to its constitutional infirmity. Members of Congress who support the Israel Anti-Boycott Act must withdraw support. All Members of Congress must publicly oppose the bill and affirm the First Amendment right to support political boycotts – including those aimed at achieving Palestinian rights. “We must create a shock wave [to fight BDS] because, otherwise, the efforts are just not working at the moment,” said Amnon Goldstof. A group of IDF reservists is preparing for a fight on another front – countering the Boycott, Divestment, Sanctions movement sweeping its way across US college campuses. “We must create a shock wave [to fight BDS] because, otherwise, the efforts are just not working at the moment,” Amnon Goldstof, co-founder of Reservists on Duty, told The Jerusalem Post recently. The organization was established in January to counter the Breaking the Silence group, an NGO that provides anonymous testimonies of alleged IDF transgressions. Since its establishment, the group has expanded its activities to target the growing BDS movement, attracting the support of hundreds of IDF reservists, as well as military brass and MKs from across the political spectrum. “Today, the main goal of our organization is to fight against the new anti-Semitism and the groups that lead it, primarily BDS,” Goldstof said. According to Goldstof, the boycott movement is a manifestation of classic anti-Semitism “pure and simple” and he sees it as his civic duty to fight the phenomenon. “Old anti-Semitism wanted to see a world without Jews, and the new anti-Semitism wants to see a world without a Jewish country,” he said. There are many groups trying to counter the BDS movement, he added, though most are trying to use hasbara, public diplomacy, to depict a positive picture of Israel rather than to confront the phenomenon head-on. “Everyone wants people to see how good Israel is, how much we have to offer, but this isn’t working [against BDS],” he said. “We decided to change strategies, stop being on the defensive and to go on the offensive and stop apologizing and to, instead, expose BDS for what it really is,” he explained. The group is working on a campaign set to launch in the coming months that aims to provide a direct and “shocking” response to the boycott efforts. “Everyone will know what BDS is, what new anti-Semitism is, and what the dangers are – we have been there in the past,” he said. Goldstof, along with other members of the organization, is currently touring college campuses and meeting with Jewish students and parents in the United States to learn firsthand about BDS and form partnerships with organizations fighting it. “Every week we are visiting more campuses and hearing lots of stories and learning more about BDS,” he said. For example, he said the group has learned that many of the leaders of BDS are Jewish and Israeli students in the US. “It is a lot about the identity of Jewish youth that is looking for the victim to identify with. We need to bring back the pride for Israel,” he said. The worry is more among the parents’ generation than among the younger generation, he explained. Goldstof reiterated a number of anecdotes he has heard from students and parents regarding bullying and aggressive actions targeting Jewish students by BDS activists on a number of campuses. He called it “unbelievable” that in 2016, Jews are afraid to walk around on the streets of many countries in the world and that every Jewish institution must hide behind a security barrier. “It is as if the world didn’t wake up – 70 years later [after the Holocaust] and the world doesn’t realize the direction it is heading in,” he said. Still, Goldstof asserted, while he is overly pessimistic about this new anti-Semitism, he is ready for the fight, with the collaboration of many new Jewish organizations he has met on his US visit. Goldstof looks like a stereotypical sleazy, pushy, boastful, vainglorious fat Jewish thug right out of some movie about the Jewish Mobsters. Ahhhh YES - this must all come to pass, but in the wink of an eye - it will be all over! I’ve been receiving this Letter EVERY Year since I joined ROCOR in 2009. Prior to that I was with the Old Calendar Greek Church from 1992 thru 2009. 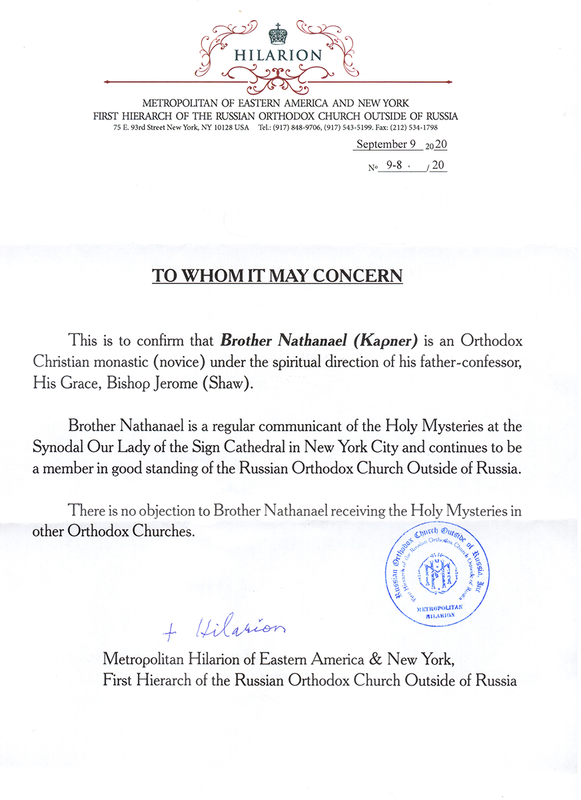 Prior to that I was with the Orthodox Church of America from 1987-1992. I NEVER LEFT The Church. I’m STILL in financial straits since PayPal banned me back in February. For the young and old alike there can be few instances of self satisfaction conviction than to look back and know (through the grace of God) you made the right decision regarding Religion and politics. How many Israhelli & Israhell-loving congressmen & women in the US Senate will, in the fullnes of time, be so vindicated? I sense you were chosen by the Holy Spirit when the time was right (in your life) to do the most vital of work for mankind. By the tireless wisdom you have extolled here at RJN that choice has been fully justified. Many of us here at RJN from time to time may utter the erroneous, this is to be expected. What is altogether exhilarating is the confidance family members can have in YOUR judgments on Church and State! Pffft. Trump & his bunch know that an army full of weaklings could not possibly win the upcoming full-scale wars they are hatching against Iran, Syria, Russia and God-knows-who’s-next, so better keep it as heterosexual as possible. GAZA CITY, Gaza Strip — Video footage showing Nidal Aboud, a young Palestinian Christian man, reading his Bible amid a crowd of Muslims performing Friday prayers July 21 in front of Al-Aqsa Mosque in Jerusalem created a buzz on social media. Palestinian activists saw the video as an example of coexistence between Muslims and Christians in Jerusalem and an expression of a shared fate against Israeli measures in the city. Palestinians have been staging sit-ins for a week and a half now in the streets of Jerusalem and around Al-Aqsa Mosque denouncing Israel’s attempt to install metal detectors at the entrances of Al-Aqsa Mosque to search worshippers. Palestinian Christian youths and activists have also participated in these sit-ins to express their rejection of these measures, even though they target Al-Aqsa Mosque, a religious symbol of Muslims. Aboud, 24, from Mount Olivet in Jerusalem, seen praying among thousands of Muslims, told Al-Monitor that he participated in the sit-in in front of Al-Aqsa Mosque as an act of patriotism. He said, “A day before the sit-in, I saw on TV an elderly Palestinian in a wheelchair crying because he was not allowed to pray at Al-Aqsa Mosque. “Because I am a Palestinian national it is my right to defend all of my country’s religious sanctities,” he said. Aboud added that when they started praying, he was asked to join them. “They were very welcoming and they placed me in the center. At that moment, I began to recite Bible verses. We were all praying with great fervor,” he said. Denouncing Israel’s attempt to install metal detectors at the entrances of Al-Aqsa Mosque, he stressed that Christianity is an integral part of the Palestinian cause. “I would not accept such metal detectors to be installed at the Church of the Holy Sepulchre, so why would I accept them to be installed at Al-Aqsa Mosque?” Aboud said. The participation of Palestinian Christians in Al-Aqsa protests and sit-ins is attracting media attention as it reflects the strong interfaith relations in Palestine and represents a means to promote national unity and tolerance. She strongly rejected Israel’s measures, describing them as unacceptable and against freedom of worship. “It is not about a specific religion. We must have the courage to reject Israeli practices against one of the most important and sacred mosques for Muslims,” she said. The Church of the Holy Sepulchre is one of the most important Christian religious monuments in Jerusalem, located deep inside the walls of the Old City. According to Issa, there are 50,000 Christians in the Palestinian territories: 47,000 in the West Bank and the rest in the Gaza Strip. It is said that Muslim Caliph Umar Ibn al-Khattab had written to the people of Aelia (Jerusalem) upon the first Muslim conquest of the city in 638 a document in which he assured safety for their churches and properties, provided that no Jews live with them in the city. This assurance is one of the most important documents in the history of Jerusalem and Palestine. The Israeli government decided July 25 to remove the metal detectors installed at the entrances of Al-Aqsa Mosque, only to replace them with surveillance cameras. Everything IS broken. Seems like every time you stop and turn around, something else just hit the ground. The GOOD news is how lovely is your dwelling place, Oh Lord, Almighty (the only true shelter from the storm). The Jews who were under Satan’s spell crucified their Messiah. That same power group have been rewarded by the Prince of this world, and have untold wealth and power as we get nearer to our Lord’s second coming. We know their machinations are doomed to failure, but very troubling times lie ahead as Scripture foretells, for devout Christians. As in Jesus’ time his true Jewish followers were the original Christian converts. I pray that Jews come to their Christ in increasing numbers to show the new Sanhedrin that their Earthly Kingdom is in error. A Jewish conversion is particularly powerful (IMO) for obvious reasons. And no better example is shown in your gospel message, Bro Nat. We must pray, pray pray and pray again, especially the very perfect Lord’s Prayer. Nothing will stop the Jews except Christ Himself. Trump is likely a part of it all and is just a sideshow for the goy. How fast and far we have fallen. Indeed, politics (whether right, center or left wing) cannot save us, our ethnicity (whether Jew, Russian or American, etc) cannot save us, but Christ God does save us! He calls all into communion with Him in the unity of the Faith of His Church. Orthodoxy transcends culture. The mission of the Orthodox Church is to transform every culture, baptizing it with the truth of Christ and new life in Him. This is how we love God, our neighbor, our people. The only way this baptism and transfiguration of our culture can happen, is, if we, the Orthodox Christians in this land, stand together, united, prayerful, humbly repenting, articulating, living to the best of our abilities and with God’s help, the timeless Truth of Christ as He’s revealed it to His holy Church. By repenting ourselves of our sins, by striving to live authentic Christian lives of integrity, by growing this and other missions, we spread the Gospel and the Orthodox Faith, we witness to the truth of our Faith, the Truth that is Christ and the life that is only in Him. More spiritual ‘hospitals’ are formed, more ‘islands of sanity’ in an otherwise sin-sick world. Only in this way, can we hope to love as Christ loves, not condemning others, but bringing them to the same knowledge and love of God that we hold so dear, that is our hope, our life, salvation for all.